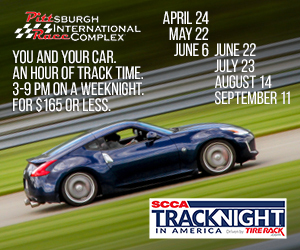 The Northeast Division Club Racing season begins at the end of March through the end of October. For the Regional drivers, there is the Kryderacing series, which hold races at Nelson Ledges near Warren, Ohio, and the New York State Road Racing Championsip (NYSRRC) which holds events throughout the Division. The Steel Cities Region hosts a double Regional event and our crown jewel, The Cumberland National, at Pittsburgh International Race Complex in Wampum, PA.
For the Major Series drivers in the Northeast Conference, there is the Majors series, which culminates at the end of the year with the week-long Runoffs® where the best drivers from all over the United States gather to compete. Our home track is Pittsburgh International Race Complex in Wampum, PA.
PIRC is a 2.8 mile, 19 turn road course located just north of Pittsburgh, PA. The track is approximately 36 feet wide with ample run off areas. The track comprises of multiple elevation changes along with medium and high speed corners as well as a long front straight. Combined Track Specs. If you enjoy Cigar’s please join us for a Drew Estate and Smoke Stack Cigar shop event for deals on DE cigars.